We are delighted that Callagher Estate Agents has returned as Principal Sponsor for ARTBEAT 2014.
and played a very important role in the success of last year’s event. Every student deserves a state of the art learning environment and your support and donation will help us ensure this. Money raised on this night will support major school improvements and the building upgrades to our school over the past year. art, craft and music. Can you help? Contact us if you would like information on a tailored package. Thank you to our superhero supporters who are integral to our ability to stage Artbeat. The Royal hotel have helped us with that all important feature of a night out - the bar. Thanks especially to Mark who you can meet on the chocolate wheel! One of Australia's biggest wineries is supporting a very small school - and for that we're most grateful. The council's practical assistance has been integral in making the art exhibition happen. A big thanks to Mayor Darcy Byrne. 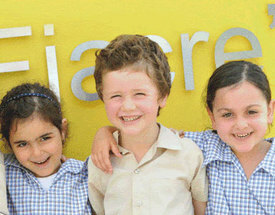 St Fiacre’s is a small catholic primary school in Leichhardt of 127 students. Established in 1886 under the Sisters of St Joseph, the school has a long and rich history. In the last year, the children have benefited from a complete modernisation of the learning environment. The classrooms were transformed into learning spaces where colour, texture and natural light enhance the look and “feel” of the school to promote learning. The learning spaces are larger and brighter, filled with contemporary furniture and designed to allow personalised learning and collaboration for both teachers and children. Technology as a strong feature that allows children to have the right kinds of tools for learning, creativity and collaboration. The fundraising effort will continue this important work.